This book introduces certain aspects of mathematics and sciences in general, as they relate to the subject of aviation, from the wheels-up to the wheels-down, and the time in between. The topics include meteorology, thermodynamics, combustion, drones, mechanics, dynamics, navigation, flight plans, and general aviation-related guidance. The book also presents the use of statistical analysis in describing the aircraft characteristics based on performance charts. The book may be used as a reference and includes examples and case studies with step-by-step solutions. Readers new to the field who are working towards their recreational, private, or commercial licenses or one already flying a single piston or multi-engine aircraft will benefit from the content. Includes aviation-related case studies, where the reader can see how the conceptual material is applied to practical scenarios. 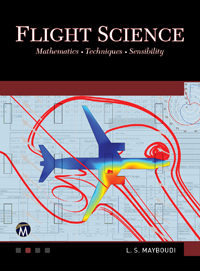 Derives equations, displays the relations in diagrams, and shows the applications of statistical methods to analyses of aircraft performance charts, providing powerful tools for aviation-related research. Mechanical modelling of flying objects and weight-and-balance calculation methodologies are discussed as well. Provides pertinent historical background to aviation-related topics such as meteorology, navigation, and mapping, enabling the reader to put in context the current state of are in these areas. Presents in detail all essential elements of a real-world flight plan, enabling the reader to use the methodology and example when creating their own flight plans. 1: Connection between Aeronautics and Thermo-Fluid Sciences. 2: Meteorology. 3: Climate and Atmospheric Thermodynamics. 4: Thermodynamics of Air. 5: Dynamics of Air and Forces. 6: Piston Engine and Combustion Process. 7: Unmanned Flying Objects. 8: Performance Charts. 9: Navigation. 10: Flight Plan. 11: Special Scenarios. 12: Converting a Piston Engine Aircraft to a Turboprop Aircraft. 13: Upper Airwork. 14: Good Practices and Lean Six Sigma Implementation. 15: Conclusion. Appendices. Bibliography. Index. Layla S. Mayboudi holds a Ph.D. from Queen's University (Canada) in mechanical engineering. Her research areas include heat transfer modelling and validation, thermal management, thermal imaging, and flow optimization. She also has industrial experience and training in operations research, process improvement (Black Belt Lean Six Sigma certified), and mechanical test management. Dr. Mayboudi has published books, journal articles, and conference papers, and has several years of experience in education, aerospace, and rail transportation industries where she initiated and completed numerous projects resulting in improved capabilities (efficiency and effectiveness). Dr. Mayboudi has a strong aviation background and has accumulated over 300 solo and duo flight hours (mostly in the Cessna 172).